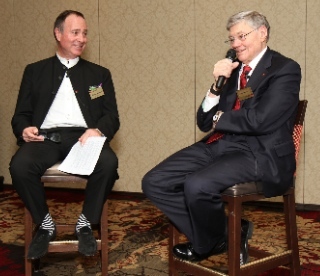 Murray Neilson (left) conducted a good-natured but informative interview/chat with Tom Monaghan, founder of Domino’s Pizza, and of Legatus. Photo by Patrick Novecosky. Tom Monaghan is best known as the founder of Domino’s Pizza and former owner of the Detroit Tigers franchise. But for the past three decades he has been more concerned with fostering Christian character in corporate executives and in underwriting Catholic higher education. 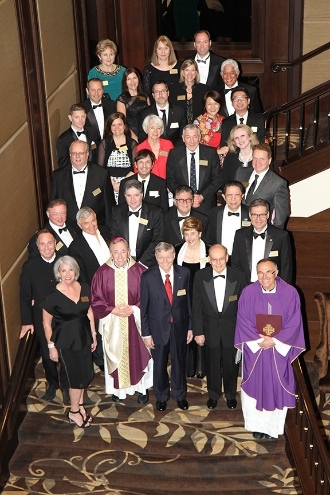 Monaghan was the honoured guest at the Legatus of Vancouver chartering event March 3 at the Terminal City Club. He founded the movement in 1987 as an international organization of Catholic CEOs and presidents who would commit themselves to living as ‘ambassadors for Christ in the marketplace.’ There are now more than 4,000 Legatus members in 70 chapters around the world. Though there have been meetings in this area for several years, the gathering marked the official launch of Legatus in the Vancouver area. Archbishop Michael Miller celebrated mass, assisted by Fr. Stanley Galvon, rector of Holy Rosary Cathedral. They will be, respectively, chaplain and assistant chaplain of Legatus of Vancouver. Mass was followed by induction of charter members, a meal and an interview with Monaghan. The evening was hosted by the new president of the organization, Patty Neilson. Archbishop Michael Miller celebrated mass for the Legatus gathering. Photo by Patrick Novecosky. Miller reminded the gathering that Pope Francis urges us to “place the human person and the common good first,” and encouraged them to cooperate with others having a similar ethical commitment, even though the work environment can be unfeeling and hostile at times. Membership chair Murray Neilson interviewed (chatted with) Monaghan after dinner. Monaghan said the main point of Legatus is to encourage influential people to “nourish their faith.” Underlining the particular focus of the group, he pointed out that while lawyers might be more articulate and academics more intelligent, CEOs are more influential. “Everyone looks up to CEOs,” he said, “not necessarily for the right reason, but they do because they’re successful.” Therefore, he added, it is good to have them formed as role models. Monaghan told something of his rags-to-riches story. Where did he get his faith from? He spent several of his formative childhood years living in an orphanage with Polish nuns. What was unique about his franchise model? He insisted on a personal connection with franchisees, which in turn contributed to the company’s spectacular growth. Charter members of Legatus of Vancouver at the Terminal City Club. Photo by Patrick Novecosky. How about owning the Detroit Tigers and immediately winning the World Series? Rewarding, of course, but “I took my eye off the ball” during that period, buying yachts and planes and generally living the high life. He said he began to put things in perspective again after reading C.S. Lewis’s Mere Christianity. “I took what I call a millionaire’s pledge of poverty,” he said, and gave up most of those luxuries. Legatus hosts a monthly speaker series for members. Coming up are Jennifer Baugh, national executive director of Young Catholic Professionals (April 7) and Raymond Arroyo, news director and lead anchor for EWTN Global Catholic Network (May 5). people from the business community come to be inspired and empowered by amazing leaders who fearlessly share their triumphs and tribulations and how their faith in God has positively impacted their personal and business lives. The next speaker will be Joey Horvath (April 6). Past speakers have included John Fluevog, John Neate, Wayne Wachell, Yonah Martin and Peter Legge. Beyond the economic, political and social fabric there is another strand in the city – the spiritual. . . . We develop relationships with business leaders and connect them with ministries serving the community of Vancouver. City in Focus regularly hosts breakfasts at the Vancouver Club, along with spiritual retreats and the Annual BC Leadership Prayer Breakfast. The 50th Prayer Breakfast is coming up April 22. LeaderImpact “offers collective learning and mentorship for marketplace leaders through weekly peer groups, regular leadership forums and global exchanges.” It will host this year’s Leadercast simulcast Architects of Tomorrow May 6 at the Sandman Signature Hotel in Richmond. The vision of the Entrepreneurial Leaders Organization is “to become the world’s leading organization to equip, connect and celebrate Christian marketplace and entrepreneurial leaders.” Their annual Vancouver ELO Conference will be held November 30. Every year Regent College hosts its signature Pastors and Leaders Conference. While it is by no means uniquely related to business people, the focus this year – Equipping People for Vocations in the Workplace (May 4 – 6) – illustrates its traditional concern with training lay people for ministry. Regent also operates the Marketplace Institute. Trinity Western University’s School of Business professors are practitioners as well as academics, and exert an influence on the broader community through their courses, mentorship program and public lectures. ← Around Town: Human Rights win, Numb, Laing Lectures . . .